Chargebee provides advanced options for numbering your invoices and credit notes. For the sake of brevity in this document, the word "invoice" would stand for "invoice and credit note" unless specified otherwise. The figure below specifies the various parts that an invoice number can have in Chargebee. Prefix: A prefix, when enabled, will be on all invoice numbers and thus help identify all the invoices generated in the Chargebee site. Dynamic Prefix: A second optional prefix that indicates the date, month and year of the invoice. Several formats are supported. 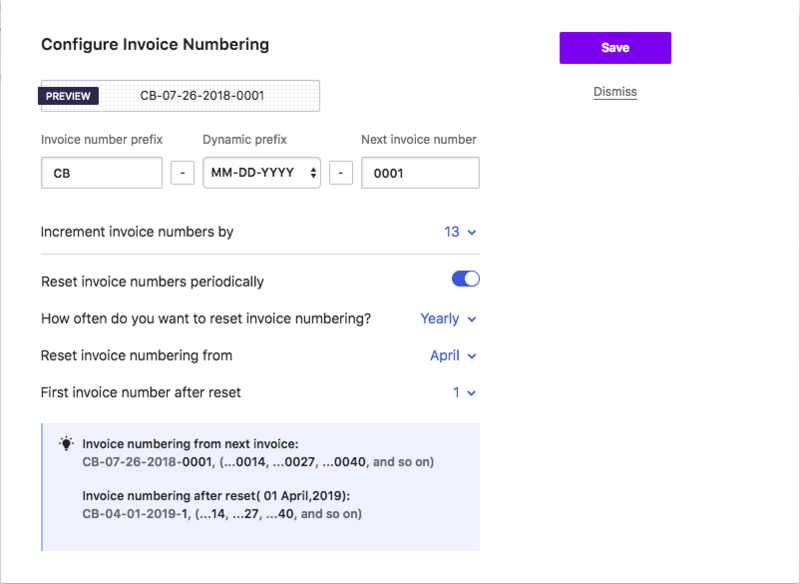 Numeric Part: This is the number that increments each time a new invoice is created in Chargebee. This is an essential part of the invoice number. Separators: You may choose to use the hyphen (-) as a separator between parts of the invoice number. Listed below are some useful invoice formats. Steps for configuring each of these formats are given in the next section of this document. Simple invoice numbers incremented by 1 for each invoice generated. No prefixes or separators here. You can set your invoice numbers to begin from a specific number, say 50001. Click here for steps on setting this format. Fix the number of digits for invoice numbers by filling-in leading zeroes. Note: As seen in the last two numbers in the series above, the invoice number can eventually exceed the number of digits set. Click here for steps on setting this. Here are the steps for setting this format. Reset the numeric part of the first invoice number everyday to say, 10000. When resetting yearly, another dynamic prefix is available: Fiscal Year (FY). Making a dynamic prefix mandatory when you are resetting invoice numbers. Allowing only compatible dynamic prefixes for yearly, monthly or daily reset. Click here for steps on enabling invoice number reset. You may want to be discreet about how many invoices are being generated by your company by wanting to generate random invoice numbers. Although random invoice numbering is not strictly supported, Chargebee can help by allowing you to increment your invoice numbers by a value greater than 1. Note: Credit note numbers do not have this feature. Click here for steps on configuring this. Chargebee prevents you from applying any setting that may result in duplicate numbers. Clicking on Save only saves the settings in draft. The settings are applied when you click on Apply changes on the previous page (Customize Invoices, Credit Notes and Quotes). As you make the changes described below, a preview of the next invoice number is shown at the top. Keep Invoice number prefix and Dynamic prefix blank. This field is pre-filled with the next number that would be created for an invoice. (The value is 1 if no invoices have been generated yet). You may keep the pre-filled value or enter the number you wish to have on the next invoice. If you wish to fix the number of digits then insert leading zeros too. Set the Invoice number prefix and Dynamic prefix as required. Enable Reset invoice numbers periodically and specify How often. When resetting daily or monthly, the number will reset on the first invoice of every day or month respectively. If resetting yearly, choose the month of reset in Reset invoice numbering from. The number will reset on the first day of that month. Choose a Dynamic prefix from the options available. If resetting yearly, you could also choose Fiscal Year (FY) as an option. Choose the default value of 1. Or specify a value that the first invoice number should take on each reset. If you wish to format the invoice number to have fixed number of digits, insert leading zeros in this field till you have the right number of digits. Eg. If you wish the invoice numbers to reset to 4 and the number of digits must be 6, then enter 000004 in the field. Note: A preview is shown for what the invoice number would be on the next reset. As mentioned earlier, there is no way to generate strictly random invoice numbers in Chargebee. However, you may set Increment invoice numbers by to a suitable value to avoid generating invoice numbers sequentially.